It's all here in Northern New York State! ...and we cover every last inch of this area. 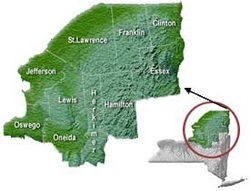 Our member departments hail from every county in the Northern New York region including Jefferson, St. Lawrence, Franklin, Essex, Lewis, Oswego, Clinton, Hamilton, Oneida and Herkimer counties. People in our region like knowing they are protected by a volunteer fire-fighting organization. Although the terrain is rough in places, and the locations we must reach are often remote, our members take pride in knowing they will do everything possible to make it there. In turn, the NNYVFA takes pride in knowing that we are here to support our members and give them a sense of community within their communities. The Northern region of New York State covers one of the largest geographies in our state, and yet is also one of the most sparsely populated. With an area like this, it sure helps to know that even though your neighboring fire departments aren't nearby, they are joined by a strong community of other volunteer fire departments and volunteer fire fighters: the Northern New York Volunteer Fireman's Association.